Best Off the Beaten Places in Naples, FL. It’s crazy to think that my hometown is one of the world’s most visited places. There are palm trees everywhere and the beach is only minutes away. Now living 700 miles away in Greenville, South Carolina, I feel like I know Naples so much better. As a former local, I am giving you my favorite places to make sure I stop at when I’m home! My heart beats a little faster for small businesses. I love that Kunjani is ran by a mom and daughter duo from South Africa. Not only are they making delicious coffee and serving the yummiest pastries, they are also changing the world. One side of their coffee shop holds jewelry and crafts made by artisans all over the world. Some are local to Naples and others are residents of South Africa. It’s definitely a hidden gem that won’t be hiding much longer. Koreshan State Park is located in Estero, Florida. (Estero is only 15 minutes north of Naples) If you’re looking for a perfect backdrop of photos, this is the best spot. There are small houses around the property. Although the houses are vacant, it was a small community build by the Koreshans. You’ll see some houses used to be sawmills, bakeries, boat works, and even a printing facility. If flowers are your love language, this place is for you. With over seven different gardens covering the 170-acres, you’ll find plants perfect for different climates. There is also a children’s garden where you can find a butterfly house. If you want a photo of you holding a butterfly, that’s the place to be. Like I said, Estero is only 15 minutes north of Naples. It’s not as developed as Naples but still tons to do. Estero River Outfitters is the best place to kayak and/or paddle board because the waters are easier to paddle through. (It’s also $14 for 2 hours of kayaking! Steal!) If you’ve never kayaked or paddle boarded before, I would definitely recommend this for all experience levels. Plus, the owners are so kind and extremely helpful. Tacos and Tequila opened a little over two years ago and is already the new craze. The atmosphere is casual with doors open and the chips are made to perfection. Right now there are three locations in Naples, but I think this one is the best. Their menu has so much variety that no one is going hungry. If it was up to me, i’d have the California Taco and the Signature Taco for dinner every single night. It’s that good. Have you visited Naples before? What’s on you “must do” list? I took 10 years “off” from the art world to develop my business career. In that time, the other necessary skill-sets developed: Time management/meeting deadlines, dealing with pressure, paying attention to minute details and learning confidence, among other things. Today I hung an art show. It took nearly 4 months of continuous thought, planning and anticipation. I am happy to say that today I felt that I got to combine all things: those moments in the studio with a cup of coffee, those moments of high stress and attention to detail. Being an artist IS hard work. You are allowing people the privilege to judge your art, which ultimately means they are judging YOU. It is my hope that this show is the first of many, that my skill sets are always getting developed and that I have the joy of preparing to exhibit a piece of my heart to the public. I have a lot to be thankful for. 1st Friday- Snow Hill, MD. Last night my husband and I drove to Snow Hill, about 30 minutes from Salisbury, to check out their 1st Friday. I absolutely adore that little town. It has so much potential. Thankfully, it seems that in recent years it has been getting more traffic and art-related business to join its streets. I have to say that THE place to go in Snow Hill, if you admire art, is BIshop’s Stock. They have a wonderful thing going there. When we entered the front door, Ann Coates, the owner welcomed us and invited us to enjoy a wine tasting as we perused the celebrated show. 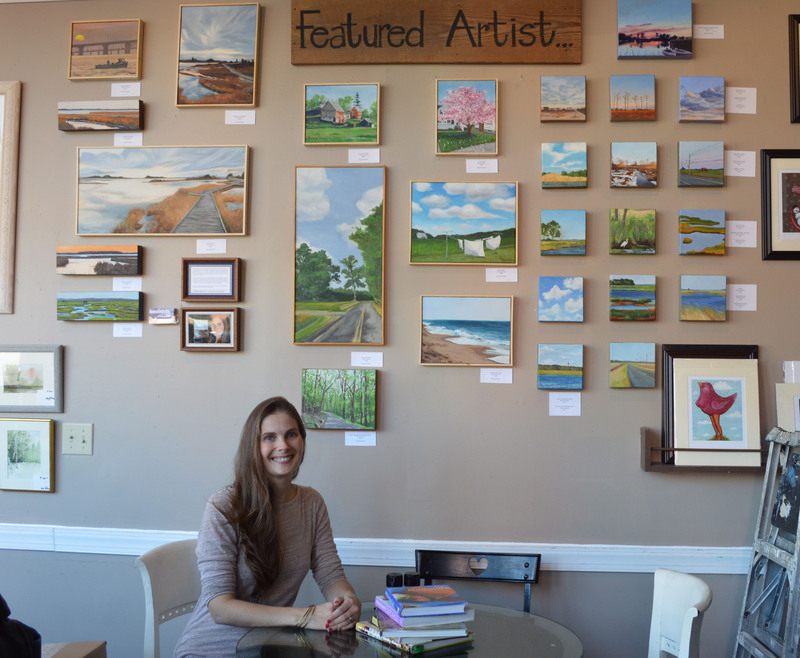 On the walls were recent works from Ann Hayden, a resident of the Eastern Shore of Virginia. Her pieces depicted the beautiful birds that she observes from her home. The colors, all muted and soft, were one of the most beautiful aspects of the pieces to me. Usually, it seems that artists who paint wildlife have the need to glorify and exaggerate the palette. Why do they do that? Nature is pretty enough. The most surprising part of her show, in my opinion, were the titles of the paintings. You’re standing there, looking at these delicate birds and then you look to see this title: “I have seen the moment of my greatness flutter” or, “I’m starving”. It was refreshing to see a sense of humor in a title. Sometimes that’s the hardest part of the painting process to me.